Unusual player character. The PC is in suspended animation and cannot move. All action and exploration must be done by proxy through the control of the six robots, each of whom perceive the environment in unique ways and have different capabilities. 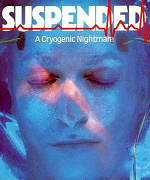 The original packaging for Suspended featured a life-sized white plastic mask representing the player's frozen face looking out through the front of the box. Suspended (Michael Berlyn; publisher: Infocom; 1983; Z-code 3). Suspended is available on the Classic Text Adventure Masterpieces of Infocom CD. Suspended at TV Tropes Wiki. This page was last modified on 20 October 2014, at 04:32.